1. 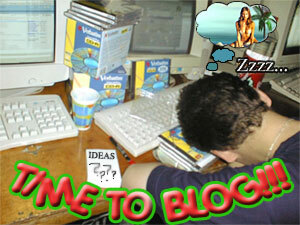 Find a free blogging service, such as LiveJournal, Blogger, etc, etc. 5. Spend the next seventeen hours creating a functioning website from scratch. If using Microsoft FrontPage(TM), relocate all children and elders to a safe area out of your “profanity zone”. 6. Complete your self-made blog template by clicking on the “Publish Website” command in Microsoft FrontPage(TM). 7. Watch in shock as the aforementioned seventeen hours of hard work gets permanently deleted off your hard drive by Microsoft FrontPage(TM). 9. Declare “Screw It!” and choose from a pre-made template. Always choose one with lots of kittens and flashing animated GIFs. 10. Make sure the template is ready for your first blog entry. You can do this by going to your new blog’s URL address and seeing if the page loads properly. It will have no posts yet, of course, as you have not actually written your first blog entry. (If you do see a post written by yourself at this specific moment in time, read it! You’ve traveled back in time to warn yourself about the “Publish Website” command in Microsoft FrontPage(TM)).